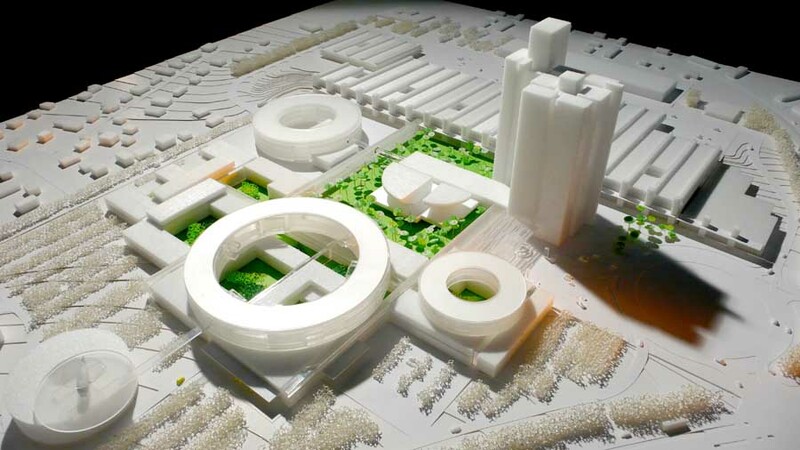 The planning of Ørestad began in 1994 and has a archetypical modernistic layout. Although the development is not yet fully developed, much has been built and it gives a clear impression of the direction the development is going. With Ørestad 2.0 we aim for a strategy, where specific urban interventions are used to update and improve the area. The district of Ørestad North 1) is well integrated with Copenhagen. The districts Ørestad City 2) and Ørestad South 3) are more remote and regarded as the actual Ørestad. There are many challenges, however. The two districts are divided by a highway and a railway cutting, and the conditions for public life are poor. We propose to condense the current plan, within the street scape, below the elevated metro tracks and on top of the highway. The new urban fabric improves the coherence of the two districts and defines a new center with public space and buildings with various scales, expression and functions. The urban densification has the potential to contain a larger amount of built floor area than district planned on the Amager common. This allows the common to remain untouched and be a green oasis centrally placed in Copenhagen. This strategy is aimed at one of the newer and somewhat criticized neighborhoods in Copenhagen. The planning of Ørestad began in 1994 and has an archetypical modernistic layout. Although the development is not yet fully developed, much has been built and it gives a clear impression of the direction the development is going. With Ørestad 2.0 we aim for a strategy, where specific urban interventions are used to update and improve the area. The district of Ørestad North1) is well integrated with Copenhagen. The districts Ørestad City2) and Ørestad South3) are more remote and regarded as the actual Ørestad. There are many challenges, however. The two districts are divided by a highway and a railway cutting, and the conditions for public life are poor. We propose to condense the current plan, within the street scape, below the elevated metro tracks and on top of the highway. The new urban fabric improves the coherence of the two districts and defines a new center with public space and buildings with various scales, expression and functions. The urban densification has the potential to contain a larger amount of built floor area than district planned on the Amager common. This allows the common to remain untouched as the green oasis centrally placed in Copenhagen.